Like millions of others, I am swept up in the Mad Men phenomenon, watching with fascination as the advertising men (plus Peggy and Joan) drink whiskey, and then more whiskey, and then even some more. After starting this blog, I began wondering how Don Draper would react if he was in the world of social media instead of advertising. I think of social media in 2010 as the television advertising of the 60’s. People are just starting to notice its power, and many are wondering if it is just a fad. 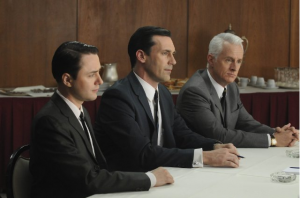 So instead of Don sitting at Sterling Cooper Draper Pryce, I’m going to pretend he’s in front of an iMac with his Twitter and Facebook open, and his blog in front of him. What would his rules be? If he was my mentor, what would I do differently? Here are the top five lessons I think Don would try to teach me. I won’t give anything away for those of you who still have to watch, but Don is a risk taker. He will do what he needs to do to land an account and play fierce with his competition. I am not a risk taker by nature, but when breaking into a business like social media, it can’t hurt to throw a little caution to the wind. In such a saturated market, it will take some risks to get noticed by those who matter. I am still working out what my big risk will be, but if I had Don on my team, I would have done it already. One of my favorite parts of Mad Men is the relationship between Don and Peggy. He knows she does good work and trusts her to do so. Since I don’t have a team, I am applying this to trusting my fellow bloggers. I trust that those who I make a point to follow are putting out the best content they can and that they are hoping I am going to learn from it. I usually do. And I am working hard to reach the bar that many talented people have set so high. Peggy and her fellow copy writers are shown lounging about, thinking. They sit and let ideas come to them, wash over them, before deciding to pounce on them. What a glorious notion. I bet nobody in today’s world of constant status updates has considered thinking before typing. What if instead of posting our every thought, we posted only the really good ones? What would Facebook and Twitter look like then? I try to follow this rule, but I am definitely guilty of some spontaneous tweets. Don would not approve. Don knows it’s part of his job to schmooze with the clients, take them out for chicken kiev and at least a dozen whiskeys. I think of this as the time I spend commenting on other blogs, keeping up with Facebook, making connections on Twitter. I use it to really make connections, forge relationships, and if one day I am lucky enough to meet some of these people face-to-face, I will make sure to buy them a drink. The workers of Mad Men work hard and play hard. They reward themselves at the end of a long day or a big sale. They work hard to achieve, but then they take a break. If I see a big increase in blog readership, my first reaction is to say Yippee and then work even harder to see it go up more. Perhaps first I should take the time to savor my victory and allow myself a few hours to revel in my accomplishment. I honestly don’t know when the last time I did that was. I know Mad Men is just a TV show, but it’s a show about work (most of the time), and I can see the beginning of social media mirrored in the advertising world of the 60s. There is a lot to be learned from watching Don and company work (besides how to be a functioning alcoholic). Do you agree or do you think I’m totally bonkers. enable threaded comments under discussions in your wordpress dashboard and your replies will appear under the person who you are replying to. It is enabled. I wonder why it doesn’t work. I’ll look into it. Thank you for the tip! I’ve never watched Madmen, but I really like the way you tied the character types in with the various aspects to marketing through social media. Take care Rebecca, thanks again for your comments over at Famous BLoggers. Thanks Alex! I hope those angels get wings. I’ll make it my life’s goal 🙂 Thanks again for the comment. Nice article. To be honest I haven’t been watching Mad Men at all but it’s probably cool 😉 But I truly agree with you. In order to succeed with social media you need to take risks. This may mean trying out several things and testing out what works and what not. Hi Julius, I totally agree that taking risks is necessary for success. It can be scary, but I’m sure there’s an inspiration quote out there somewhere that says if we don’t take risks, we don’t gain anything. If anyone knows that quote I’m talking about, leave it here. Thanks for the comment! do you think that Don would have any particular take on the audience itself? That is, in Mad Men, his audience is fixed, whereas with Social Media it is very fluid and mobile; global even. Don might create an ad for a magazine with US circulation, but a tweet can be seen from China to Brazil in a matter of seconds!